The Cleveland-Cuyahoga County Port Authority (CCCPA) owns and operates the Cleveland Bulk Terminal (CBT), one of the Port’s two maritime facilities in the Cleveland Harbor. Located on Whiskey Island, the CBT is the region’s premier multimodal transportation center and is critical to America’s Maritime Highway System M-90 corridor. 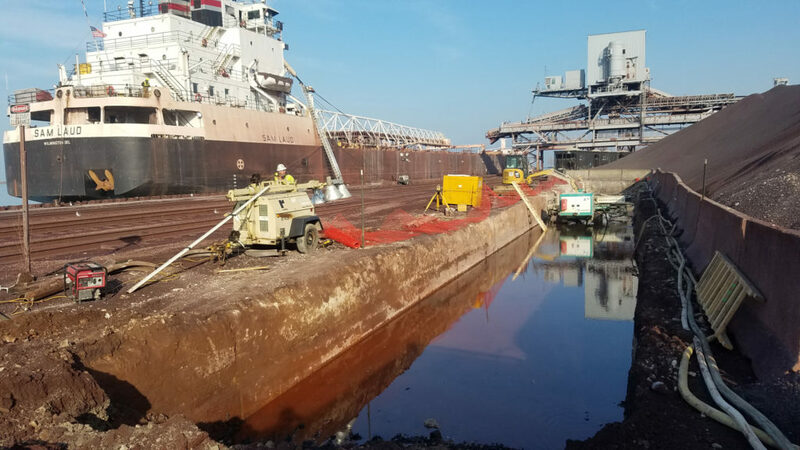 The CBT supports marine transportation by ship and barge, as well as land transportation by rail and truck, facilitating the movement of dry bulk commodities, including 2,000,000 tons of taconite annually. In 2016, KS led an inspection of the CBT’s waterfront structures. The inspection revealed that, to sustain safe marine access to the facility, the 70-year-old infrastructure needed a major rehabilitation. Mark was Project Manager and oversaw the inspection and subsequent design of nearly eight million dollars’ worth of infrastructure improvements at the CBT, including the total replacement of 1,200 feet of steel sheet pile bulkhead. Infrastructure improvements at the CBT are under construction and are on track to be completed this spring. Mark shared the many challenges that the design team overcame, including programming the project to ensure no disruption to the CBT’s busy shipping schedule and ongoing operations, meeting aggressive design and construction schedules, addressing inevitable unforeseen site issues during construction, coordinating the needs of several stakeholders, and remaining in compliance with regulatory agencies. KS Associates was also among the exhibitors at CES. The Cleveland Engineering Society is a non-profit professional development organization serving engineering and technical professionals by providing valued and topical conferences, professional testing review courses, networking, and leadership opportunities. The Annual Design & Construction Conference provides educational opportunities and recognizes the achievements of professionals in engineering, architecture and construction. For more information about the CES, go to www.cesnet.org.